That was me two weeks ago, talking to the DirecTV phone rep, breaking up with my NFL Sunday Ticket Package. There are now more ways than ever to get your NFL fix. In addition to DirecTV’s Sunday Ticket, there’s Sunday Ticket Max, SundayTicket.TV, NFL Mobile by Verizon, NFL Game Pass, NFL Now, NFL Red Zone, The NFL Network, Sirius/XM, ESPN, and the broadcast networks. CBS is going so far as to stream multiple games online this season. Even Yahoo is getting into the NFL broadcasting business. Oh, and of course you can still go to games in person, too, if that’s your thing. But I won’t be using any of them. After three decades of faithful NFL fandom, I’m done with the sport. I just can’t in good conscious give the NFL another minute of my time, let alone another dollar from my wallet. Technology didn’t create the problems that make me despise the NFL, but it’s helping illuminate them. From MRI scans, to high-tech new stadiums, and even just Internet-based fantasy football leagues, modern tech has teased out just how far the organization will go to turn a profit. And something is clearly broken. Big hits, big injuries, big deal? First, there’s the NFL’s concussion problem. This is probably the most troubling aspect of the sport for me. Over the course of the last decade, advances in medical tech have led to startling discoveries about just how damaging the sport is to its players. It’s now apparent that the very basis of the sport — repetitive, upper-body collisions — causes brain damage that players have to live with long after their careers end. The NFL has been shameless in its efforts to quash this legitimate scientific research. Former players have had to sue to hold their former employer accountable for their actions, to get any kind of relief. Let me be clear about this: The problem isn’t that players voluntarily entered a dangerous sport and broke some bones, but knew what they were in for. We’re talking about a level of physical damage that’s invisible to the naked eye, damage that the NFL went out of its way to deny even existed at all. We now know there’s no such thing as a “minor concussion,” and that players don’t just “get their bell rung,” yet the NFL still pays people in the media to dispense those myths. The worst part of the NFL’s handling of the issue? By attacking the science itself, the League isn’t just affecting the lives of its own players — it’s affecting the lives of anyone who plays football at any level, even kids who don’t play past middle school. 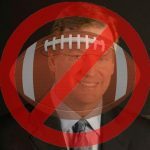 Even if the NFL were to suddenly change its tune on concussions, it still has what I call “the new stadium problem.” As the sport has grown more popular, NFL owners — with the league’s backing and support — leveraged that popularity to hold communities hostage for new stadiums they don’t need, threatening to move franchises to new cities if they don’t get their way. What do they want? Taxpayer-funded, billion-dollar stadiums. What else do they want? Every single piece of revenue those stadiums generate, even from non-football events. What don’t they want? To pay for them.